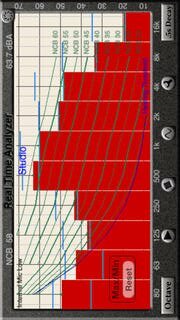 Transfer Function is a dual-FFT acoustic analysis app that is used for sound system audio analysis. Since it can operate with music as the signal source, it can be used during a musical performance to monitor and turn the system equalization during the show. Normally a transfer function requires a two-channel interface, and that is true with this one, also, if you want to use it with program material (music). However, you can use our Transfer Funciton with the internal iOS microphone, if you can send the pink noise generator output to the sound system input. In this configuration, the internal generator is routed back to the input as the reference channel. You can measure delay, magnitude, and phase using this setup. When you use Transfer Function with a two-channel audio interface to run, such as the Studio Six Digital iAudioInterface2, then you can also use any audio source as the test signal, including music.